A brief look at the main activities that the Vietnamese engage in as they celebrate the Lunar New Year. Even though the usually hectic life in Vietnam’s major cities goes through a major reversal during the Lunar New Year holiday (Tet), there is actually a lot of activity that happens during the most uplifting time of the year for most Vietnamese people. 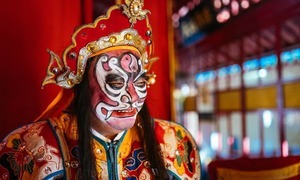 This year, people will enjoy nine days off to celebrate the festival, from February 2-10. Visiting relatives and friends is one of the the most popular activities at this time. Dressed in their best clothes, a family will go to the homes of relatives, neighbors and friends to wish them a Happy New Year. During these trips, adults give the children "lucky money," a small envelope containing cash, which is believed to usher in prosperity. 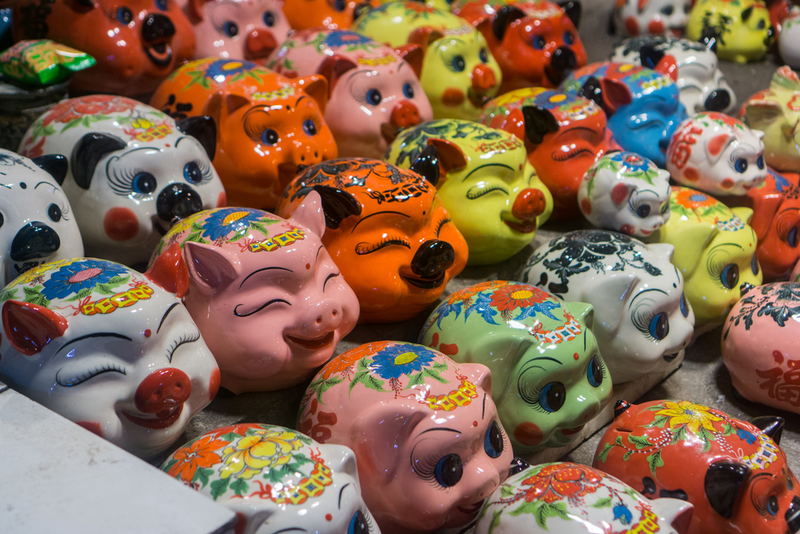 Children usually put this money into their own piggy banks, which will be broken after Tet to count their takings. 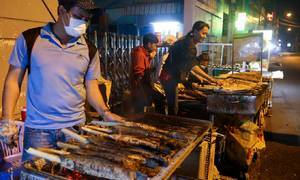 A few days before Tet, people travel to their hometown to unite with their family. 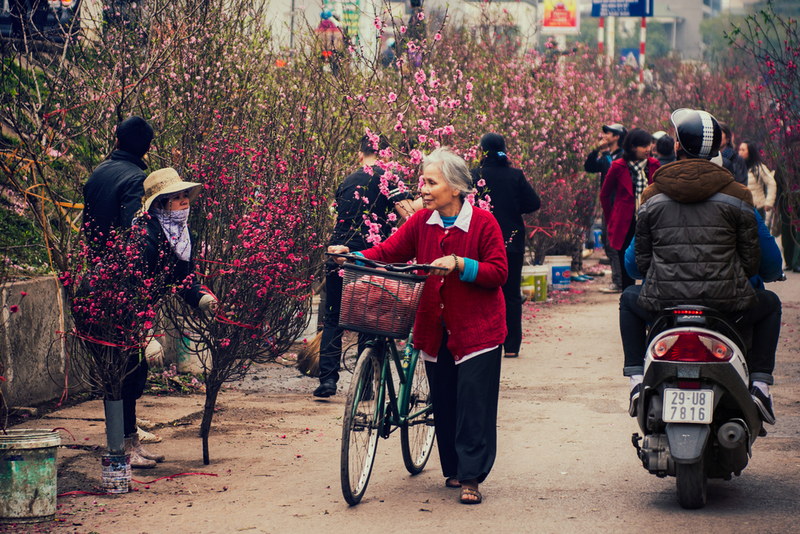 As flowers and trees are indispensable items for Tet, people in the north will decorate their houses with pink peach blossom branches, plants or trees, while those in the south do the same with ochna integerrima, or yellow Mai. People also spend hours looking for fruit-laden kumquat trees to brighten their homes that are spring cleaned to welcome the first guests. 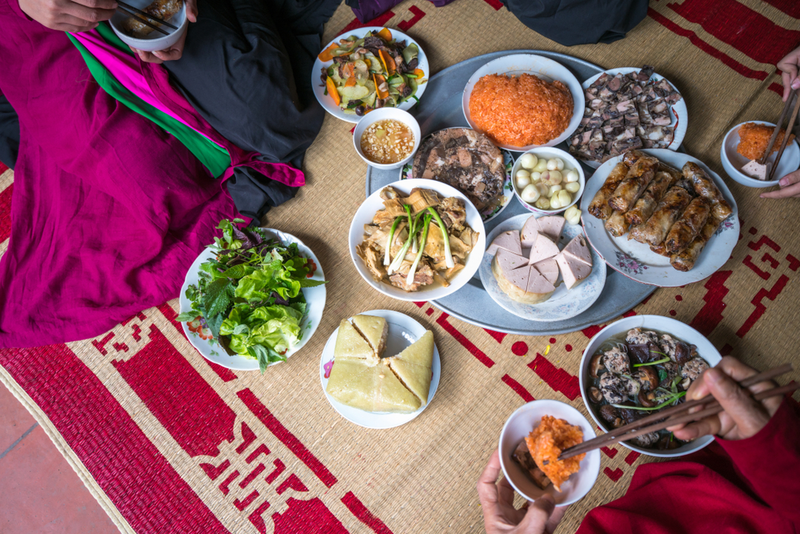 Like other special days of the year, having good food is importance for Vietnamese people during Tet, which has its own culinary traditions and specialties. 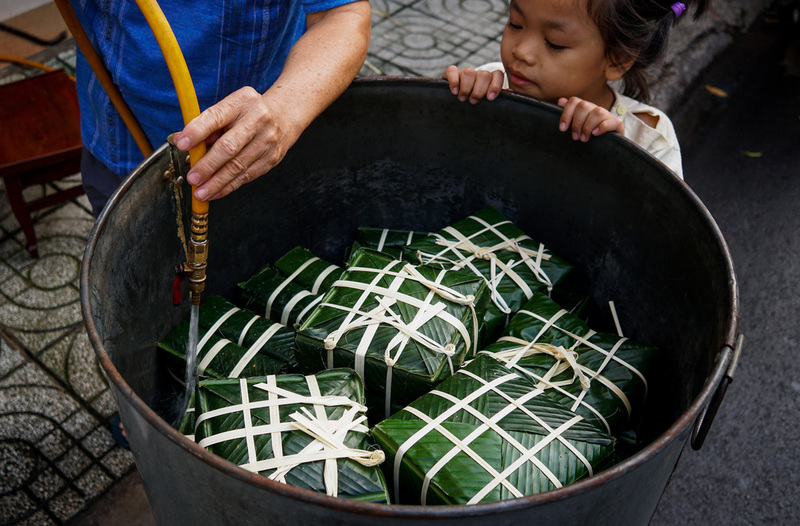 The most popular Tet food is banh chung, a square-shaped pack of sticky rice with meat and bean fillings wrapped in green leaves. Another version of the dish is called banh tet, which has a cylindrical shape. Both are enjoyed with pickled onion or cabbage. The first family meal of the new year, consists of banh chung, Vietnamese sausage, fried spring rolls and bamboo shoot soup with pig’s feet. 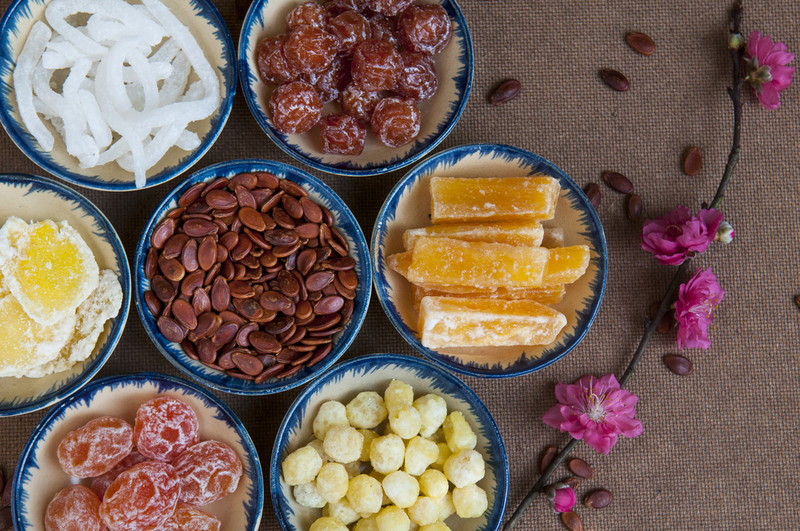 Mut, or dried candied fruits, is another food that is mostly consumed only during this festival, offered to guests and given as gifts. Coconut, carrot, mandarin oranges, apples, bananas, ginger and gourd are among the fruits and vegetables with which mut is made. These sweetmeats are usually presented in a rounded tray and served with hot tea. Vietnamese people try to make Tet a time of happiness. 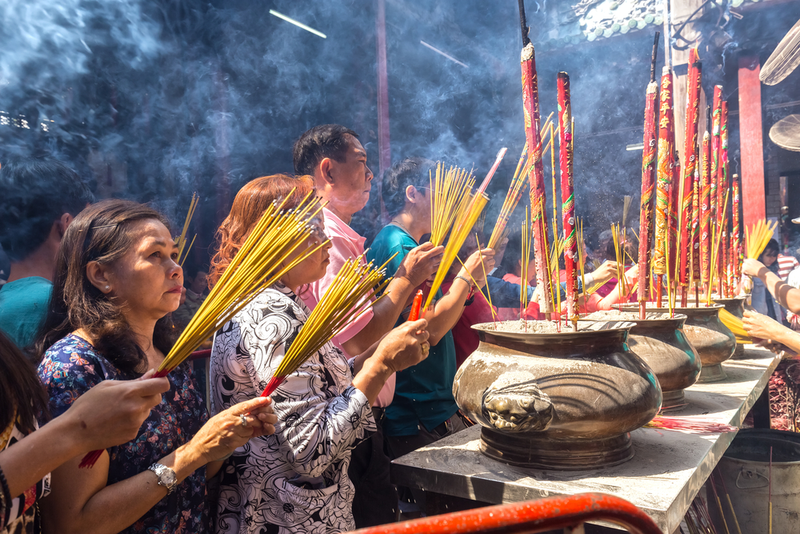 All family members worship at the family altar during Tet, offering food and burning incense, praying that the ancestors and divine spirits watch over and bless them. The first person to enter the house is given great importance as he or she is believed to bring luck to the family. 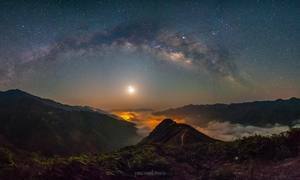 A person whose zodiac symbol corresponds best with the forthcoming year is chosen to enter the house after the stroke of midnight. This ritual, known as xong dat or "first foot," is believed to bring prosperity and luck. Visiting temples is another popular tradition during Tet. 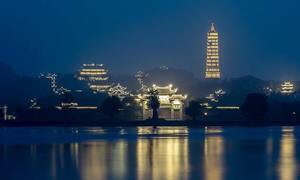 Many people go on pilgrimages to famous pagodas and temples. 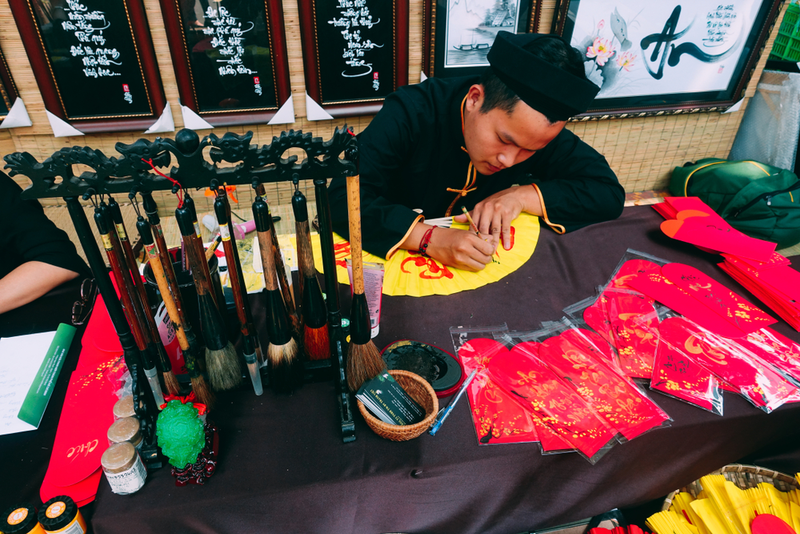 They also ask ong do (calligraphers) at the temples to write Vietnamese or Chinese words for things that they desire most in life, including "happiness," "luck" and "prosperity."